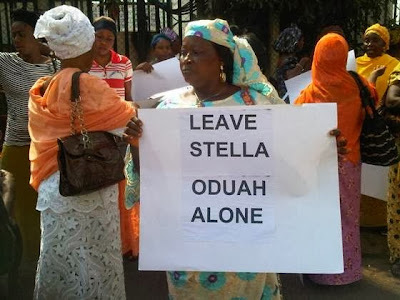 A group of women held a protest in favour of aviation minister Stella Oduah on Thursday morning in Abuja. 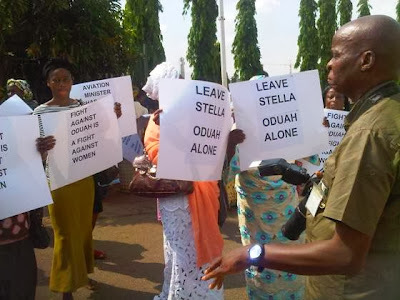 The group consisting of middle-age to elderly women gathered together to show their support for the Aviation minister currently battling a multi-million naira corruption scandal. Contrary to their claims, the small group of women only represented themselves and not all Nigerian women. 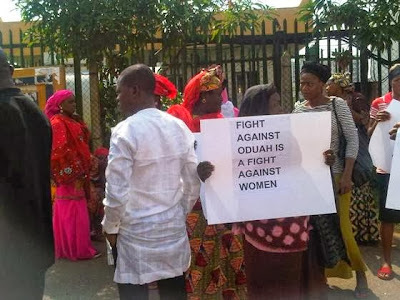 Sources claim most of these women are uneducated people paid to carry the placards. These are illiterates as far as I am concerned because a well educated woman will not fall so cheap. Never. so because she is a woman, we should clap for her for diverting money dat is enough to take care of all the children in my state. Nonsense upon rubbish. This women can hardly be blamed for carrying placards against common sense. Insead of that, we should educate them about the dangers in collecting money from those parasites called leaders in this country. Many of our political leaders are very verse in exploiting the weak, poor and the vulnerable in our society. Evident have shown that the vast majority of people were not aware of the tactics used by the political players. By taking money from these heartless, arrogant and selfish leaders, you have morgaged your fundamental and absolute right to your freedom and your children’s chilren as a citizen of federal republic of nigeria. So, if by any chance you know anybody or people who still engaging themselves in this act, pls do make it known to them of the dangers and the illegality of it.